You couldn’t pick a better time to shop for a new road bike. Today, manufacturers offer more models than ever in a wider variety of price points. And component companies make an exceptional array of top-notch wheels, brakes and shifting systems that operate like never before. For example, it’s possible to get 20-speed drivetrains that shift blink quick, and wheelsets so light that pedaling is effortless. In fact, there are so many attractive choices today, that if you just walked into our store, you might be overwhelmed. Don’t be. Having a lot of choices is a wonderful thing because it drastically increases the likelihood you’ll find the perfect bike — as long as you know a little about what’s available. To help, we’ve put together this comprehensive guide for finding the ideal road rig. We explain the decisions you need to make and offer advice on everything from frame materials and wheels to gearing and component choices. To start, though, you need to do some self analysis (therapist not required). Also, consider how many miles you might log per week, or year. And think about your tendencies in purchasing other things. For example, do you demand the highest quality, or are you more apt to look for reasonable quality and lower cost? Do you dig trick, high-tech gadgets or are you satisfied with simpler designs? Additionally, it helps to know about how much you want to spend because that’s a quick way to focus the selection process on the appropriate models. 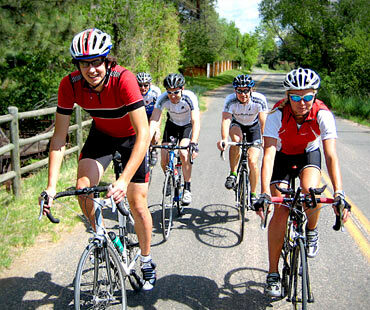 Answering these questions will ensure that you get the best bicycle. We’ll be able to show you models with the right features for your needs, interests and budget. And you’ll soon be sailing down the pavement with a big grin on your face. There are lots of fascinating variables in choosing a modern road bike. The rest of this article explains these choices so you’ll have an easier time selecting your dream machine. But first, realize that fine bicycles are built of all these materials. Also, two frames can be constructed of the same material yet have entirely different ride qualities due to differences in geometry, assembly, tube shapes, and material manipulation (reinforcing a tube, for example). Which is one of the reasons it’s so important to test ride and feel the bikes you’re thinking of buying. 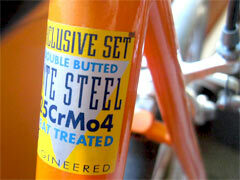 The most traditional frame material, steel, has been used by framebuilders for well over a century. Many types of steel tubing are available and the material is easy to bend and shape. Plus, there are myriad methods of assembly making steel very adaptable to cyclists’ needs. It also offers excellent ride quality, durability, is easily repaired and affordable. If there’s a knock on steel, it’s that it tends to be heavy when low-quality tubing is used (found on bikes sold at department stores). And, while there are new steels almost impervious to corrosion, most types can rust if treated carelessly (protect that paint job!). High-quality steel frames integrate great design, superior assembly, and better alloys in the tubing. A popular quality steel for bicycle frames is American SAE 4130 steel, better known as “chrome molybdenum,” and referred to as “chromoly” or “chrome-moly.” And, there are plenty of other impressive alloys offered by tubing suppliers such as Columbus, Tange and True Temper. Frames built of these materials are famous for their combination of responsiveness and comfort. Steel is an excellent fork material. It can be formed into any shape; even aero ones. It’s plenty strong. And, it also absorbs shock to soften rough roads. Steel forks are heavier than those built of lighter materials such as aluminum and carbon. Aluminum was first used in frame construction in 1895. But, it didn’t come into wide use until the 1980s when large-diameter tubing was conceived and construction processes were perfected. Now, it’s the most popular of frame materials. It’s subject to the same variances in assembly and quality as steel. And, like steel, as you spend more, you get higher quality tubing and better construction. You may hear that aluminum has a more jarring ride than the other frame materials. But, while this used to be the case in its early years, it’s not a problem today thanks to new aluminum alloys, tubing enhancements and improved construction techniques like hydroforming (shaping tubes with high-pressure water). These allow the frames to absorb shock better than ever while still offering the lively ride that makes aluminum so popular. This magic ride is attributed to aluminum being one of the lightest frame material. It makes aluminum frames great choices for racing and time trialing. And, unlike most steels, aluminum won’t rust; another advantage. There are various types of aluminum tubing in use by manufacturers. Some common types are 6061 and 7005, numbers that refer to the alloys in the aluminum such as magnesium, silicon and zinc (pure aluminum isn’t strong enough for bike use). And, there are some super-light tubesets such as scandium. Titanium (also called “ti”) is one of the longest lasting, lightest, and most expensive frame materials. Some cyclists and experts feel that it combines the best characteristics of all the other frame materials. It rivals aluminum in weight, is as comfortable as steel and it has a sprightly ride and electric handling that many riders swear by. The frames feel “alive,” as if each pedal stroke gets a boost from an inherent springiness in the frame. Carbon fiber (also called “carbon,” “composite” and “graphite”) is unique because it’s not a metal. It starts out as a fabric (or sometimes just a thread that’s woven into fabric) that’s impregnated with a glue called resin. The resulting material can be turned into tubes or shaped in molds and is usually cured with pressure and heat, turning the material into a solid structure. Frames made of carbon are extremely light, stiff and durable. Carbon’s greatest advantage is that it can be manipulated essentially in endless ways (because builders can orient the fabric strands however they want), which means it can be fine-tuned to provide just about any ride qualities desired. So it’s possible to achieve supreme lightness with outstanding rigidity (for maximum pedaling efficiency) and top-notch compliance for comfort, too. What’s more, carbon is impervious to corrosion and can be built into beautiful shapes producing Ferrari-like looks. Like titanium, because construction is somewhat complicated, and because carbon fabric and resins are in high demand by other industries, carbon frames can be on the top end of the cost spectrum. To describe these frames manufacturers use terms such as “high modulus” and “void free,” which tells you that it’s high-quality carbon material and stellar construction. Sometimes, these designations appear on frame “tubing” decals. Carbon is a popular material for forks due to its lightness and natural ability to absorb shocks. Plus, carbon forks are built for optimum handling too. As you spend more money you get full-carbon forks. There are also carbon forks that use steel or aluminum for the steerer (the fork tube that’s inside the frame). And, there are tapered carbon forks that are wider at the base of the steerer for enhanced handling. Not too long ago, when you bought a new road bike, you got fairly run-of-the-mill wheels comprised of decent rims, spokes and hubs. These wheels were reliable and worked just fine. But, they didn’t really add any pizazz to your new two-wheeler. All that has changed. Today, many if not most road bikes feature wheels that are marvels of engineering. They’re prettier, more aerodynamic, durable and light, sometimes super light. Why is this important, you ask? Because when you cut wheel weight, you drastically improve a bike’s climbing, acceleration and handling. This happens because wheels are rotating weight. And this type of heft is felt most by the rider. In fact, a few-hundred grams reduction at the wheels feels more like a few pounds reduction. On the road, it’s an amazing feeling, like suddenly dropping 10 pounds of body weight. Box-section rims are light, accelerate quickly, and provide the most comfort. Aero-shaped rims are stronger, have less wind drag, and are stiffer (less comfortable). It’s important to consider wheel feel when you’re test riding bikes. You might prefer one type to another. When choosing a rim or wheel type it’s also important to consider where and how you ride, as well as how much you weigh. For example, a 140-pound rider who spins leisurely mostly on rough pavement, will probably prefer a box-section rim for its additional comfort. But, a competitive 200 pounder on smooth roads will much prefer the stiffness and speed of aero-section hoops. Bike companies use a variety of different tires on their road models and usually, the tires are good for 1,000 to 2,000 miles, depending on your weight, riding style, and whether the tire is located on the front or back. So, the chances are pretty good that you’ll be fine riding on the tires that come stock on your new bicycle. You might consider upgrading however, if the tires are the wrong width or design for your predominant type of riding. One important difference is bead type. Beads are found in both edges of the tire. They’re the parts that grip the rim to hold the tire on the wheel. Less-expensive tires use wire beads, which add weight (remember that rotating weight is the most important kind). Better models have Kevlar (a super-tough fabric) beads. Tires with Kevlar beads are called “folding tires,” and they’re a great upgrade if you want lightweight wheels and lively handling. These tires cost more, so expect to pay for them. But, the additional expense is worth it if you want optimum ride quality. Some time-trial bikes, as well as some compact, smaller models come equipped with 650c wheels, which are smaller diameter than 700s. These are a little lighter and slightly stronger, and they accelerate faster than standard 700c wheels. But, 650c wheels sometimes ride a bit rougher (smaller, lighter riders can compensate by dropping tire pressure slightly), lose momentum a bit faster and cover less distance per revolution (strong riders will require taller gearing). So, if you’re comparing bikes with both wheel sizes, be sure to test ride them to feel the differences for yourself. That’s the best way to decide. Most road bicycles today are equipped with tires called “clinchers,” which contain tubes inside. These tires are held on the wheel with a mechanical fit. The tire beads “clinch” the rim. There’s another type of tire found on some road bicycles and available for wheelsets with rims made for them. It’s called a “tubular” and also known as a “sew-up,” (you’ll see why in a second). Tubular tires are common in professional road racing because they have a true round profile, which offers a slightly smoother ride than standard tires, something favored by those who spend entire days in the saddle. This round profile is due to the tubular’s casing being sewn together at the bottom. There’s a tube inside just like inside standard tires, but it’s sewn inside, which means repairing flats requires a lot more work. (On the road, you simply replace the tire; to fix the tire, you must do minor surgery on it.) Besides the smoother ride, tubular wheels and tires are usually slightly lighter than standard models, too, because of the fact that tubular rims are simple box sections. Tubulars aren’t common on our road bikes because of the hassles involved in fixing flats and also the fact that to mount the tires, you must glue them on the rims. However, if you’re racing, you might like to give them a try. And, if that’s the case you’ll want to learn about tubular tire gluing and tire repair. The newest road tire type is “tubeless.” Just like motorcycle and car tires, these are run without tubes, which eliminates pinch flats, saves a little weight and significantly improves ride quality. These, too, require a special rim, so bikes with wheels with tubeless-compatible rims will accept tubeless tires. This is because with tubeless tires the tire and rim fit together with an airtight bead lock. And, there are no holes inside the rim, and a special Presta valve that’s installed in the rim. We expect to see tubeless on more road bikes in the future. Right now, they’re only found on a few of our models. The main companies making full lines of road components (sometimes called “groups” or “gruppos”) are Campagnolo, Shimano and SRAM. These makers offer different levels of components to suit the various rider levels from entry-level to pro racer. A group is typically comprised of brakes, hubs, chain, cassette, bottom bracket, crank, derailleurs, shifters and headset. Keep in mind that many road bikes come equipped with wheelsets, which include hubs so you may or may not get hubs from the same manufacturer as the rest of the components on your new bike. Also, some bicycle manufacturers make or have made their own components, and you might see these on a bike instead of the brand found on most of the other parts. And, it’s a common practice to upgrade certain components where the company feels it’s beneficial. So, for example, you might get the next-level rear derailleur on a bike as a way for the bike company to add a little extra value. The most recent advancement in drivetrain technology is electronic shifting. First introduced to the mass market by Shimano, these shifters and derailleurs use lightning-fast electrical impulses to change gears. This shifting is reliably precise and quick. The integrated computer unit ensures that shifting is perfect for both the front and rear derailleurs by monitoring their position without sacrificing any shifting speed. And because there are no cables involved, contamination and cable stretch are non-issues. Surprisingly this technology only tacks on a handful of grams of weight too. There are sprockets on the front and back of the bike. The fronts are called “chainrings” and they’re located on the crankset, the part that the pedals are attached to. The crankset comes with 2 (called a “double”) or 3 chainrings (called a “triple”). Triple cranksets include a small inner chainring (sometimes called a “granny”) that offers easier hill-climbing gears. There are also cranksets called “compact” that have only 2 chainrings but have a smaller small chainring for easier climbing. These are more common than triples today. The sprockets on the rear of the bike are called “cogs,” or, if you’re referring to the entire cluster of gears, it’s called a “cassette” or “freewheel.” The cassette is attached to the rear wheel and drives the bike as you pedal. Depending on the components on the bike, there will usually be from 8 to 11 cogs on the rear cassette. How many gears to get depends on how and where you ride. If you’re reasonably fit and bike in flat to rolling terrain, you’ll probably be fine with a double chainring and 9 to 11 rear cogs. If it’s hilly and you’re getting into shape, consider a compact crankset. They provide the simpler double-chainring shifting up front with a small enough small chainring for easier climbing, too. Triple cranksets are an option for those who climb high and aren’t super strong, too. The third chainring (sometimes called the “granny gear”) offers even easier climbing than the compact crankset’s smallest chainring. When considering how many rear cogs to get, keep in mind that you’ll have plenty of gears even if you get a 9-cog cassette. 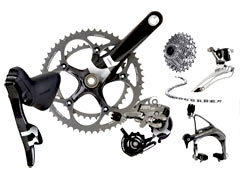 If you go to a bike with more cogs (you can’t increase the number of cogs unless the bicycle accepts that cassette), you can either choose a wider range of gears or more-closely spaced gears. 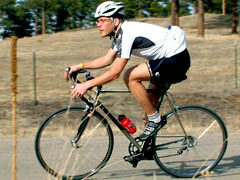 The latter is excellent for racing and training because it makes it easier to fine-tune pedaling effort. Wider gearing offers easier low gears so it’s ideal for mountain riding and for when you’re not in tip-top shape. Don’t let the numbers confuse you. The key thing to know is that for chainrings, larger numbers mean it’s harder to pedal and vice versa. For cogs, it’s the opposite: the larger the number, the easier it is to pedal and vice versa. By keeping these rules in mind, you can quickly see that a 30/42/52 triple crankset and a 12-30 cassette will offer much easier gearing than a 39/53 double with a 12-23 cassette. Many people wonder whether or not they need a compact crankset or a triple crankset. Our advice is that it depends a lot on how and where you ride. If you like the hills, ride fairly long distances, sometimes carry gear and aren’t training all the time to be in optimum fitness, a compact is a nice way to go. You get the easy shifting of a double crankset with gears that make most climbs manageable. A triple crankset gives you a third, even smaller chainring than what’s on a compact crankset. So, it’s great if you scale steep climbs, carry loads and travel long distances. Even if you don’t use the small chainring all that much, it can be a lifesaver at the end of a long ride when a tough climb stands between you and home. Triple-chainring drivetrains shift slightly more slowly than doubles, which is a consideration if you’re riding for a good time in a century, for example. If you’re not sure which is right for you, we recommend coming in and trying the various drivetrains to feel how they work for you. It’s also helpful to talk to your friends who ride and see what they recommend since you’ll likely be hitting the road with them and enjoying similar rides. Buy once. It’s less expensive to get the frame, wheels and components you want initially than to upgrade later. Proper fit is much more important than getting a good deal. And only by coming in to see us can we size you and ensure that you’re looking at the right size bicycles. Manufacturers pack as much value as they can into each bike model. But, sometimes compromises are made in component specification or frame quality to reach a more attractive price point. If a bike you’re interested in has parts or features that appear to be uncharacteristic for its price, try to figure out if any corners were cut. Or ask, and we’ll explain why the price is so good. It’s best to pick out the features and components that best meet your needs, then see what the bike costs. Be prepared to spend a little extra because usually you’ll want a few important accessories with a new bike such as a bottle and cage, a cyclo-computer, a new helmet, etc. Also, if you don’t already have pedals, you may need to purchase these too.